Webinar Update: In case you missed the webinar discussing Emotionally Destructive Marriages with Leslie and Chris Moles, a batterer interventionist specialist, click here. Stop being angry! Turn from your rage! Do not lose your temper- it only leads to harm. 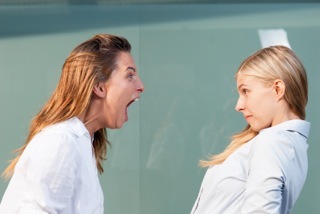 Anger is a normal part of being a human being but it can be a dangerous emotion and has the potential to wreck our relationships and our lives. Here are the four most common lies about anger. 1. When I feel angry, I must let it all out. Too much damage has been done to people we love by blurting out angry feelings in the moment of their greatest intensity. Doing this might provide some sort of relief but it is never beneficial to the hearer or the relationship. I liken it to vomiting. You do feel better getting it out, but vomit belongs in the toilet, not on another person. Better ways to get some relief from intense anger is to journal or pray your honest emotions to God. In the process, you might find some perspective on what to do with them and how to express them constructively. 2. Other people or provoking situations make me angry. Difficult people or situations don’t MAKE us angry, although they do tempt us. What really happens when we encounter these kinds of people is that they expose us. Jesus tells us, “It is out of the overflow of your heart, your mouth speaks.” (Luke 6:45). What comes up and out of your mouth when you are angry exposes what’s in your heart. Often our heart is filled with self-centered lies or desires. Instead of blaming others or the situation we’re in, we can start to understand what the real problem is that’s causing our anger to escalate. Our own thought life. Then we can work to calm ourselves down (with different self talk and God’s Word) instead of demanding that life always go our way or that everyone do what we want or make us feel better. 3. I’m entitled to use my anger to get what I want if what I want is a good thing. Anger motivates us and helps us to speak up against wrong, as well as take action to fight against injustice and evil in our world. Because it is such a powerful force however, the apostle Paul warns us not to sin in our anger (Ephesians 4:26). Most of the time what we want is permeated with self-centered desires. We WANT our way. We want to be right. We want to be first, or catered to. We want our needs met. And we’re angry because we’re not getting what we want. James 4:1 asks us what is the source of quarrels and conflicts among us? He says it comes because we’re not getting what we want. Part of spiritual maturity is to learn to accept that we don’t always get what we want, even if what we want is a good thing. Living peaceably with other people involves realizing that what I want and what someone else might want may be very different. The Bible tells us not to merely look out for our own interests (what we want), but also the interests of others. (Philippians 2:4). The truth is anger is a powerful emotion that deceives us into using it to demand our own way. 4. I have always had a bad temper and this is just the way I am. I can’t change. The good news of the gospel of Jesus Christ is that he not only redeems us but he restores us. He changes us. If you want to get a handle on your anger, anger is not the problem you must address. Your temper is a symptom of what’s going on in your heart. If you gain self-control over your temper that’s great, but the deeper problem that causes your anger is what needs to change. How we act and live flows from what is in our heart – what we desire or want the most. God wants to rearrange the desires of our heart so that we no longer want our own way the MOST, but rather we want to please him and love him and others. When God changes our heart it’s not that we never get angry, but we no longer want to use our anger as a weapon to demand our own way, prove our point or make sure everyone knows we’re right. We don’t want to hold onto grudges, nurse resentment or harbor bitterness in our heart. Instead we want to forgive and reconcile. When Jesus changes our heart, instead of only wanting MY way, I want to look out for the interests of others because I care about them and therefore I hold my anger in check when I’m not getting what I want and weigh that with what other’s might want or need. How? I’ve had a change of heart and I no longer see myself as the most important person. I am no longer at the center of my life, Jesus is. Becoming more and more like Jesus is not just trying to do the right thing, but wanting to do the right thing and then learning how. 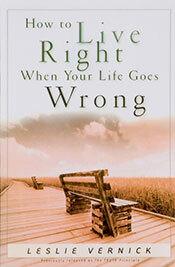 For more practical help to live a godly life, see my book, How to Live Right When Your Life Goes Wrong. There is now available a companion study guide and leaders guide for group study. For Better or Worse - What does that mean? Question: Thank you for your answer on this issue and I concur 100 percent. Can I ask this question….What about the vow we all say before God…’for better for worse’? Do we have to stay in the marriage when it is ‘for worse’? Is that breaking our vows before God? Answer: The traditional marriage vows that people typically recite in the United States are not taken directly from the Scriptures but from the Book of Common Prayer which was first published in 1662. 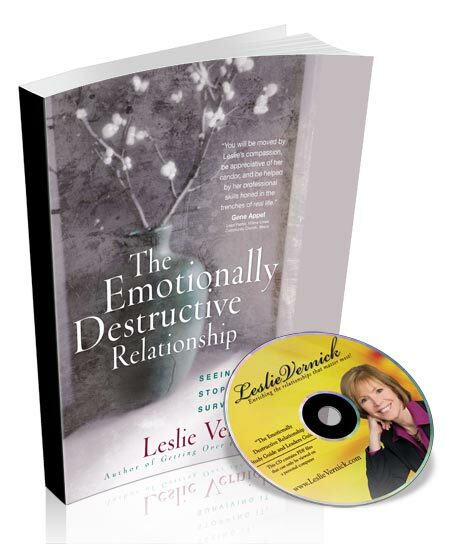 The Emotionally Destructive Relationship (plus CD containing leader's guide and study guide) by Leslie Vernick. Plus see the winner of the previous giveaway! generational effects of emotionally destructive relationships. The winners of No Stones by Marnie C. Ferree are: Judi W. of Longview, WA and Dianna L. of Dunnellon, FL.